There is nothing more heart-breaking than a box of photographs without names or dates. They often end up being 'unknown' forever. It's easy to think of them as frustrating, but I'm trying to think of them as a mystery to be solved. If the mystery cannot be solved, and many will not, you might find a permanent home for them in unexpected places. Maven, for instance, loves girls in glasses. Your 'unknown' might just find a loving place in someones special collection. They might not have a name, but their image will live on. My desire is to be able to build a history around the photos, even if I could not put a given name with a face. I wanted to add them to the Jackson County INGenWeb site as a family resource. 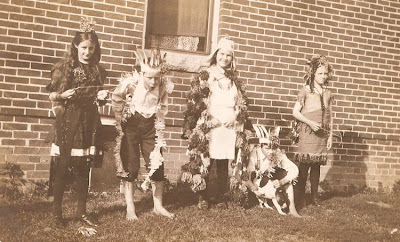 Finding 'unknown' photographs is not hard to do. Yard sales, estate sales and flea markets can all produce treasures. And I'm sure, like me, you have a folder of unknowns that you have collected over the years from your own family photograph collection. You could start looking at them differently. You might be surprised at what a second look can say. I have a large amount of photos I'm working on right now. It is made up of the contents of 2 attics, several trash-to-treasure bunches and donations of the unwanted. It was then jumbled together in several boxes with documents from the 1800's to the 1950's, and stored on a shelf in my brother's garage for several years. I know, scary! But it's all in pretty good shape. My brother is allowing me to go through it and use what I can for my county site, as the majority of them are local. The documents are easy. The photographs, on the other hand, are a challenge. I'm pretty lucky though. I know the address of the 2 attics and the history of the houses, which includes most of the surnames associated with each house. I have to put the right photo in the right house, in the time period it belongs to find the surname associated with that photo. 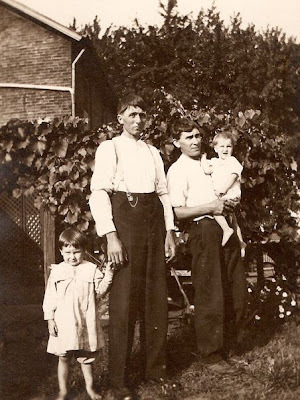 Currently I am working to put together the Marberry family, so I will use those as examples. I have posted the Marberry photos that carried a name on my Jackson County blog under the Marberry label. The first clue is canine. 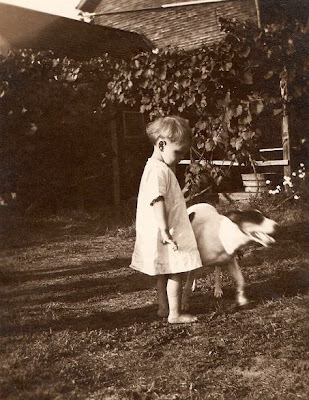 In an envelope I found this photo of a Fox Terrier and a Dog Tax Receipt dated April 17, 1911. Great clue! 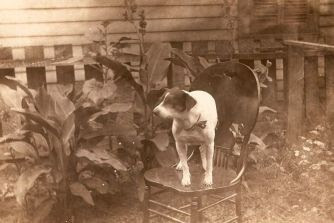 He, the dog, was part of the family, and appeared in several photos. In the above photo, notice the fence as well as the dog. There is also the house that offers a clue. First of all I know the house and the area. That house is the only 2-story brick house in the neighborhood. 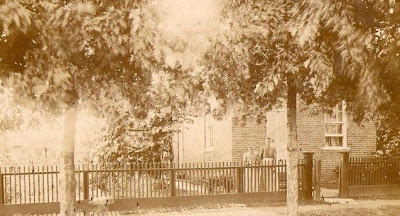 According to the 1912 Seymour, Indiana City Directory, Mr. Marberry and his wife, Rosa, lived there. As you can see from the above photo, there is a grape arbor in the back of the house. Familiar people and the grape arbor. It looks like a special occasion. Some of them are most likely visitors to the home. Notice as well that all of the clothing is true to the 1900 to 1920 era. The grape arbor is again there, proving to be a favorite photo spot. Sometimes it's a process of elimination. You list all the facts you know for certain, then carefully study the photograph and mark off each thing that does not fit. I cannot say with absolute certainty that these are all Marberrys', I can be pretty sure that some of them are. I certainly have enough information to build a family page and hope that a researcher comes along and helps to give them all names. 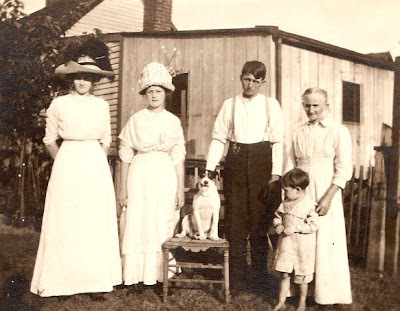 With the help of the 1900, 1910 and 1920 census, I can know more about the make-up of the Marberry family during this time period, and offer that as well. 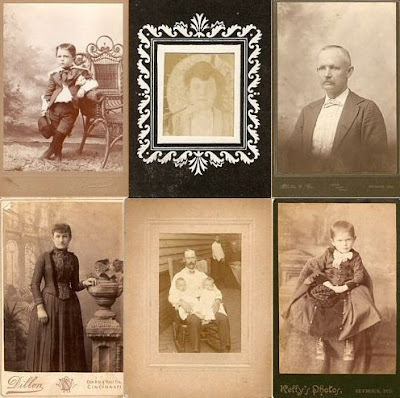 If you can know the address, or at least the area the photographs are from, can estimate the date, and have at least one photo with a surname, you are going to be more successful in putting names to faces. But there are those that are simply never going to find home. I've found studio photographs to be particularly hard. If there is nothing in the photograph for reference except clothing, and the only clue the name and location of the photographers studio, it becomes much harder to even have a surname to start with. You can have an approximate date that the photo was taken. 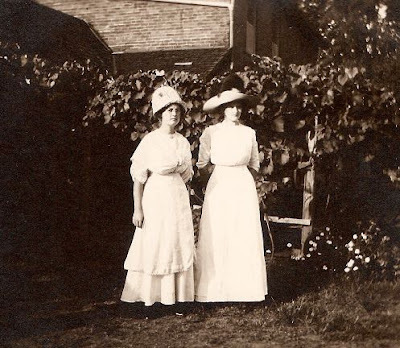 If you know the address the photo was found, or can find the surname of the family that owned the photo, you can, with a little work make educated guesses. 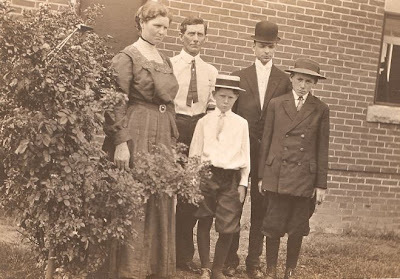 You might be able to know that the subject of the photo was a member of that family, extended or immediate, or at least a close family friend. Perhaps by posting the photograph online with the information you have gleaned, you will connect with someone who can fill in the blanks. I am really looking for reasons not to put these wonderful old photographs 'back on the shelf'. If it's a little extra work, I don't mind. I learn something new all the time. I am positive that one day someone will come along looking for their family and find 'treasure' saved from the trash bin on the county site. Those that cannot be given names might find themselves 'saved' by a collector. I love your article . Excellent, Sheri. I have a huge number of "Unknowns" from about the same era, all African-Americans from Illinois and Missouri. I like your analytical approach. Wonderful! Most enjoyable read and excellent suggestions. Thanks. I particularly like the idea of looking for clues in the photos; such as you mentioned like the fence or the grape arbor. Thank you, Sheri. Wonderful article and pursuit. I hope they find names. 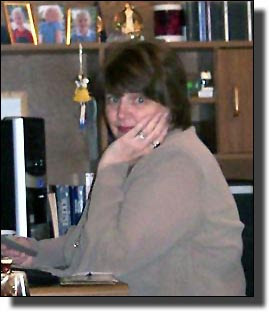 What a great article...I already referred two friends who collect photos to view your blog. 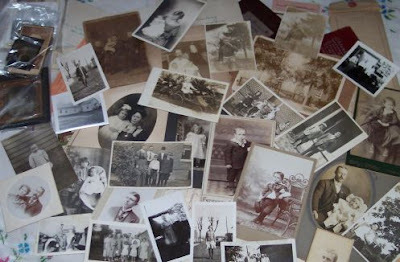 Thanks for sharing and enlighting those of us struggling to identify old family photos. Your clues are terrific! loved the pictures. they are priceless. I agree with all the above comments. Encouraging and full of excellent ideas. I, too, have many unidentified photos and like the idea of putting them online with information gathered by your analytical process.